In instances where you have terminals approaching the RPF for personnel, put a chit in the ethics files of every one of these people, that they prefer downstats and R/Sers to other type of personnel, by their own evidence of not encouraging personnel pools to come into being. Therefore, that their advice on and ok of personnel appointments must not be taken and that a personnel order signed by them is invalid. We will thus make this action of using the RPF as a personnel pool even less popular. 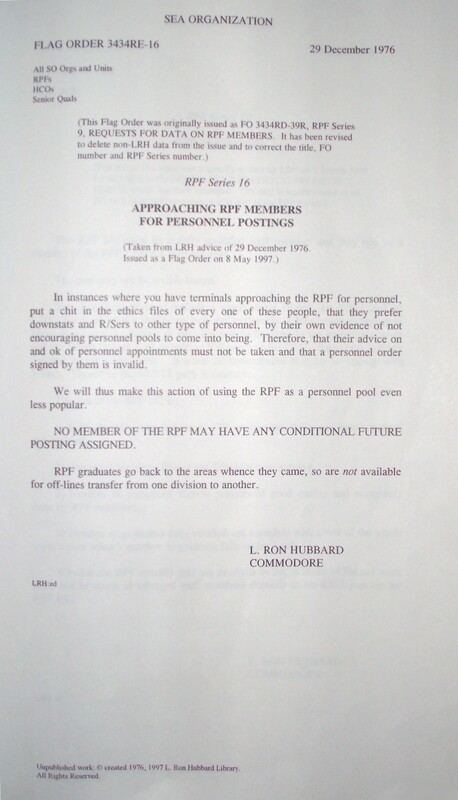 NO MEMBER OF THE RPF MAY HAVE ANY CONDITIONAL FUTURE POSTING ASSIGNED. RPF graduates go back to the areas whence they came, so are not available for off-lines transfer from one division to another.